Suggests bigger plans ahead for Italian maker. Chrysler plans to set up an all-new distribution network to handle the Fiat 500 and other products from its Italian partner. When the first Fiat-branded products begin making their return to the U.S., late this year, they’ll be sold in a separate network of showrooms, rather than sitting alongside models sold by the Italian maker’s American arm, Chrysler. It has been more than two decades since the Fiat brand abandoned the U.S. market, and its luxury arm, Alfa-Romeo, has only had a smattering of offerings here since, most recently the limited-edition 8C. But a key factor in Fiat’s decision to acquire a controlling stake in Chrysler was to use that partnership to re-establish a presence on American soil. 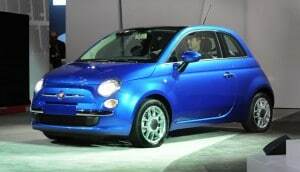 The first model to launch will be the Fiat 500, a microcar that has won an array of awards in Europe and other parts of the world. While some of the Italian makers products will serve as a platform for future Chrysler offerings, the Americanized version of what is also known as the Cinquento will retain its Fiat badge. And now, it seems, it will be the first product to anchor a new line of Fiat showrooms, according to Sergio Marchionne, who serves as CEO for both Chrysler and Fiat. Current retailers handling the Chrysler, Jeep, Dodge and Ram brands will be offered the opportunity to sign up for one of the 200 new Fiat franchises. But they will have to agree to put up standalone stores, which will include not only separate showrooms but service operations, as well, Chrysler has announced. The move comes as a surprise for a variety of reasons, not the least being it flies in the face of current trends. Barely a month ago, Ford Motor Co. decided to pare back by abandoning its long-struggling Mercury division. General Motors abandoned three brands in the wake of last year’s bankruptcy, selling off a fourth, Sweden’s Saab. Industry analysts caution that the maker could be in for a struggle, especially if it hopes to justify the investment dealers will have to make in the brand – a typical standalone dealership can quickly run up costs of over $1 million in a desirable location, and often top $5 million, according to data from the National Automobile Dealers Association. And that doesn’t include marketing costs. Launching an all-new model, according to independent auto analyst Dan Gorrell, can come in around $100 million or more, and establishing an all-new brand is even more expensive. That’s a key reason Hyundai has delayed a decision about whether to spin off its luxury model Genesis as a separate franchise, cautions John Krafcik, the head of the Korean maker’s American sales subsidiary. Fiat is expected to add other models to the line-up, and will likely draw from both the Alfa and Lancia brands, but so far the company has declined to detail future product plans for the new operation. Chrysler’s existing 2,300 dealers will receive details of the new Fiat initiative, this week, outlining the automaker’s plans for the new network. Fiat eventually hopes to operate in as many as 125 major metro markets in 41 states. The formal unveiling of the new distribution channel is expected in September, about three months before the launch of the Fiat 500. This entry was posted on Monday, July 5th, 2010 at and is filed under Automobiles. You can follow any responses to this entry through the RSS 2.0 feed. Both comments and pings are currently closed. I find it hard to imagine that many dealers will sign up for franchises whereby they have to spend 7 figures for not just separate showrooms, but dedicated service ops, versus the Scion approach where TOY dealers have a boutique set up in an existing store. This is more the the Mini model. There is also the issue of Chrysler having to support 5 brands, now that Ram has been spun off. Ad dollars are finite. Also, the timeline is too compressed, what with buying land, getting permits, designing a facility and construction time.